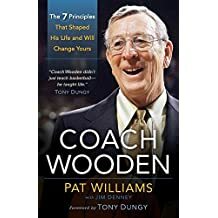 If you want to know what drove the man who has been called the most successful coach ever in any sport, this will be an eye-opening book. It illustrates clearly the impact of a Godly father; demonstrates that you don’t have to be a jerk to be highly successful in a highly competitive environment, and will, I guarantee you, challenge you to make changes in some area of your life. It did me. Great for young people as well.